This last week I had to paint my football helmet to get ready for the season. The helmet was yellow originally, and of course I forgot to take any pictures of it. It was also beat up pretty badly. I cleaned it up with some sandpaper, which did a great job. Then I sprayed a few coats of primer on it. There was some sanding and wet sanding between coats. I don’t really know how to do all this stuff on my own, so I called my uncle. He does body work for fun and profit. It is a hobby of his that he does real well with. I am a little nervous around paint and metal, but he just jumps right in knowing that everything is fixable if you have the right tools. He helped us replace the front clip on our truck and then re-paint the whole thing. When I say “he helped us,” I mean that he pointed to the next task and my wife and I pulled the whole smashed up front end off and replaced it with one from the junk yard. Then we did all the body prep up to the first coat of paint. He came out and shot the paint on for us. You see, he was laid up with kidney stones. In the week that we did all of that he was in and out of the hospital twice. We did all the work until the very end, which he crawled out of his death bed to finish up. It turned out great. 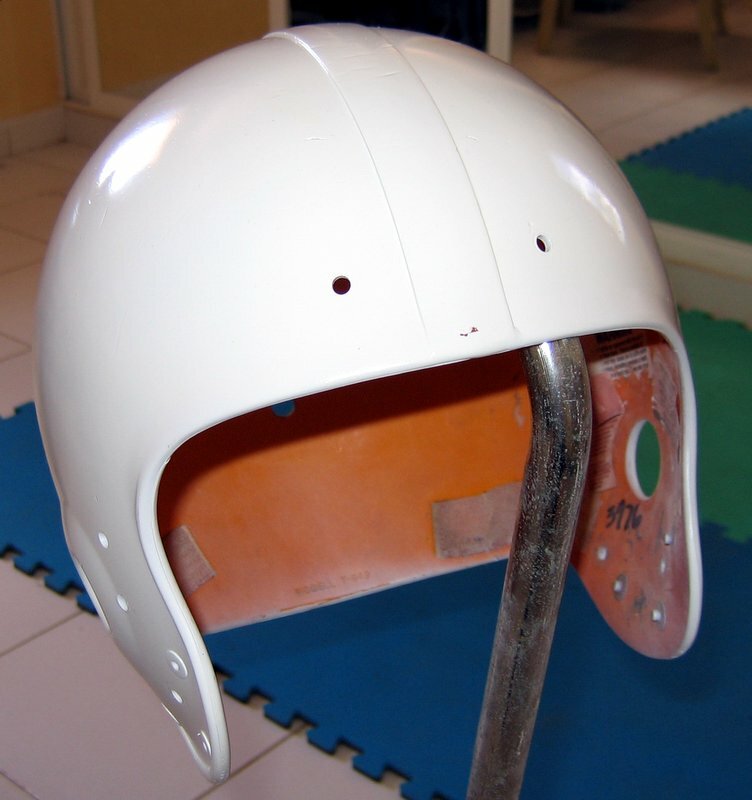 So, anyway, I called him a few times this last week when I was in the process of getting the h elmet prepped and painted. I ended up with about 4 coats of white I think. Up through 3 coats I was still seeing that it had not blended well. The final coat went on OK, but it was really hard to see the spots I missed until it dried. It was not a problem, though, since I followed that up with 2 or 3 coats of clear coat. This was all out of spray cans picked up at Wal-Mart. Not your high dollar car paint, but it turned out fine. I did get a couple of slight runs in the clear coat, but only I can see them. I tried to point one out to a friend, and even though I knew where they were, I had trouble finding one. So they are not that bad. I think it turned out nice. Now when we play our first real game on Saturday, I will get to scuff it up. If it still looks decent after this week’s game, I will throw some wax on it towards the end of next week. That will have given the paint 2 weeks to cure. 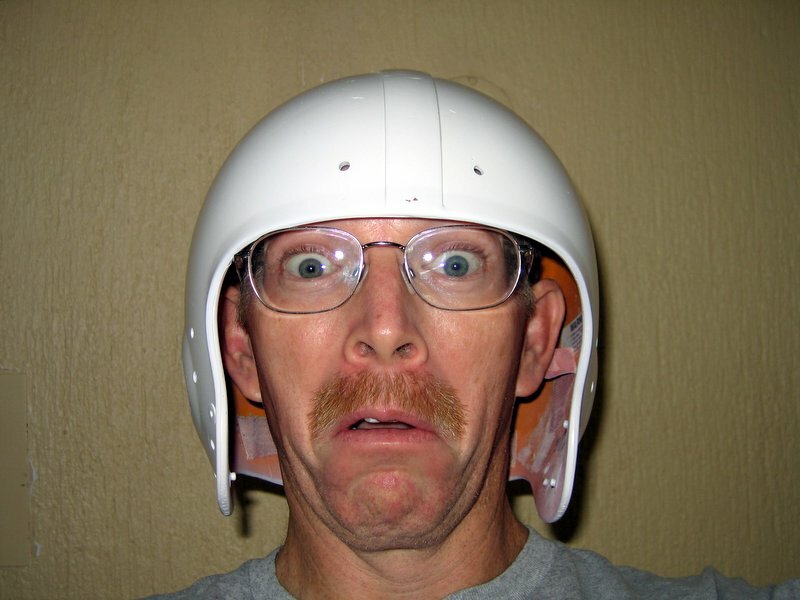 I have been bringing the helmet into the bedroom at night so that the air conditioning will help set the paint better. It is amazing to me to see the difference in the hardness of the paint 2 days after I had it in the air conditioning. We don’t have central air here and electricity is too expensive to run the A/C all day. So we just have it on at night in the bedrooms. You can click on the pictures for a larger version. You need a big Orange T on the side of that thing!!! The finished product looks great. BTW, is that the look on your face right before you get tackled? Hmm, an Orange T? I don’t think the quality of our team would do proper honor to the Vols. I just love the self portrait. That has got to be one of my all time favorite photos of myself. I may put that on all my future printed material. I will have to clear it with my wife first though. I think this picture is why you were nicknamed Calvin while in grade school. Are you sure football is ready for you? I am wondering if I am ready for football. After I get all healed up from these scrapes (which should be in a couple of days), I don’t know if I want to go back to that. Our first game is in 3 days though. So I guess I have no choice. 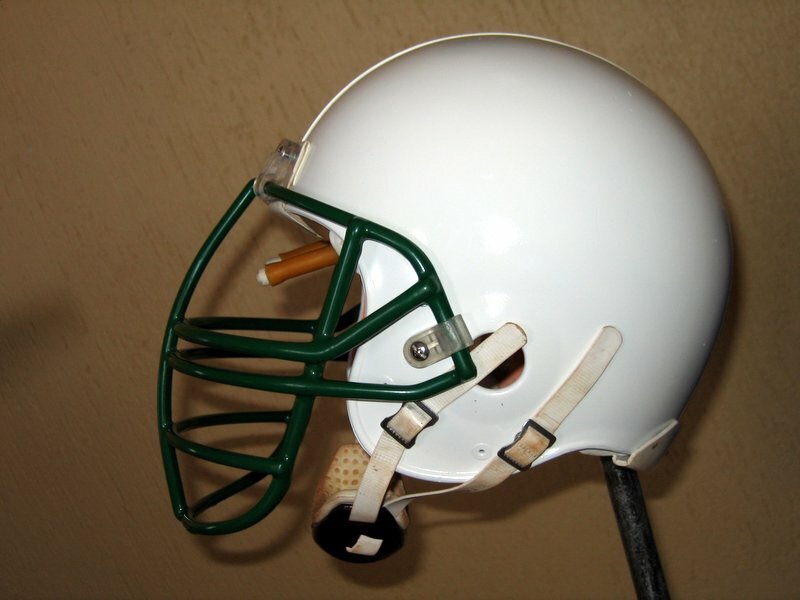 I found a very old football helmet paint hanger and I am trying to figure out the name of it and can not seem to find it. It has two wooden cones connected too a metal sqeeze thingy. 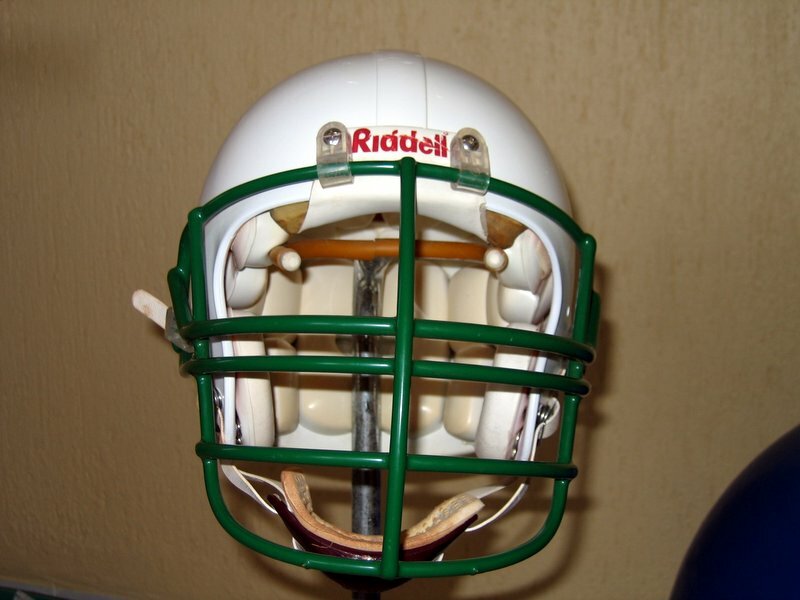 It goes inside the helmet and in the ear holes.